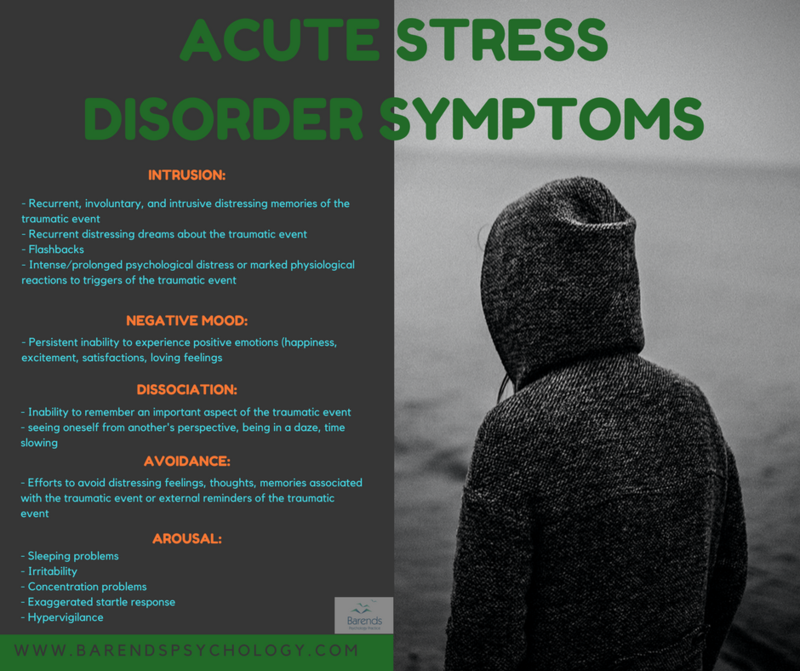 A proper acute stress disorder diagnosis helps people find the best professional treatment for their mental condition. Receiving treatment soon after the traumatic event reduces acute stress disorder (ASD) symptoms and the chance of developing PTSD after one month ,, and significantly improves the quality of life in people . There are different ways professionals can diagnose acute stress disorder (ASD), by using specific questionnaires and/or interviews following the DSM 5 or ICD-10 criteria. After receiving a diagnosis, a professional can set up a treatment plan tailored to the client’s needs. This pages discusses the official criteria for a proper acute stress disorder diagnosis, explains some of the criteria and offers examples when needed. The official criteria are obtained from The American Psychiatric Association’s Diagnostic and Statistical Manual of Mental Disorders, Fifth Edition (DSM-5). Indirect exposure to aversive details: a first responder who gives CPR to a victim of a traffic accident. Recurrent, involuntary, and intrusive distressing memories of the traumatic event. Recurrent distressing dreams in which the content or affect of the dream is related to the event. For example: having distressing dreams about the person who assaulted you. Dissociative reactions (such as flashbacks) in which the individual feels or acts as if the traumatic event were recurring. Intense or prolonged psychological distress or marked physiologic reactions in response to internal or external cues that symbolize or resemble an aspect of the traumatic event. For example: watching a robbery on television if the person just experienced a robbery himself. This could be very upsetting to the person and may lead to hyperventilation or trembling. NOTE: Children may engage in repetitive play during which themes or aspects of the traumatic event are expressed. Children can also experience nightmares unrelated to the traumatic event. Persistent inability to experience positive emotions. For example: the inability to experience happiness, joy, excitement, or loving feelings. Altered sense of the reality of one’s surroundings or oneself For example: seeing oneself from another’s perspective, being in a daze, or feeling that time is slowing. Inability to remember an important aspect of the traumatic event, typically resulting from dissociative amnesia and not from other factors (such as head injury, alcohol or drugs). It is possible for someone who experienced a car accident that they cannot remember the first 5 minutes rights after the crash. Efforts to avoid distressing memories, thoughts, or feelings about or closely associated with the traumatic event. To avoid distressing memories, thoughts, or feelings, someone may turn to alcohol or drug abuse. Efforts to avoid external reminders (such as people, places, conversations, activities, objects, or situations) that arouse distressing memories, thoughts, or feelings about or closely associated with the traumatic event. Someone who got mugged in the city center in the evening may avoid the city center and may avoid being away from home in the evening, because the city center and the evening may bring back memories of the traumatic event (being mugged). Sleep disturbance (for example, difficulty falling or staying asleep or restlessness during sleep). Acute stress disorder can only be diagnosed if the duration of the disturbance is 3 days to 1 month after trauma exposure. 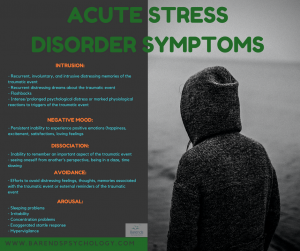 Although (some of the) symptoms may begin right after the traumatic event, they need to last at least 3 days in order to meet this criterion for the acute stress disorder diagnosis to be made. If the ASD symptoms are still present after 1 month after the traumatic event, the diagnosis PTSD may be made. For more information about PTSD diagnosis, click here. These ASD symptoms must cause significant distress or impairment in social, occupational, or other important areas of functioning. The disturbance cannot be attributed to the physiologic effects of a substance (such as medication or alcohol) or another medical condition (such as mild traumatic brain injury) and cannot be better explained by a diagnosis of brief psychotic disorder.